What should I know about insulation? Three essential elements of an energy-efficient home are airtightness (achieved through draftproofing, also known as air sealing), insulation, and sufficient ventilation. Combine all three, you get a comfortable, low-energy, lower carbon home with excellent indoor air quality year-round and lower heating and cooling bills. Additional benefits include reduced drafts, noise, and moisture problems. A tight air barrier from careful draftproofing and ample insulation are critical parts of your home’s building envelope. Ample insulation slows down the transfer of heat and cold between the inside and outside, keeping your home warm in the winter months and cool in the summer. Draftproof first, add ample insulation and then ensure adequate ventilation. What are the priority areas for insulation? Insulation works like a giant sleeping bag. It wraps the house in a layer of material that slows the rate at which heat is lost to the outdoors. The priorities for adding insulation to your home will depend on the pre-existing insulation levels in your home. If there are areas of your home that are not insulated (for example your main floor or basement walls) this would generally be the priority place to start. There may also be under-insulated areas in your home which would benefit from adding insulation. See How do I know if I have enough insulation in my attic. For more information on priority areas to insulate in your home, visit BC Hydro, have an EnerGuide Home Evaluation with a Program Qualified Energy Advisor or speak with a professional insulation contractor. Check the Better Business Bureau for reputable contractors in your area. See our Hiring a Contractor FAQ section for more information. If you live in an older home it may be under-insulated. There are a several ways to check if you have enough insulation in your attic. Your ability to check you insulation level yourself will depend on the type of the attic/roof and accessibility to the attic. Walking around in your attic is generally not recommended but if you are able to poke your head up into the hatch and look around with a flashlight you may be able to do a basic visual inspection. If your home, or upper floor, is too hot in the summer and too cold in the winter it is likely that you have insufficient attic insulation. If a visual inspection of your attic identifies that the insulation is level with or below the attic joists – you need more insulation. If the visual inspection of your attic identifies that the insulation is not evenly distributed, there are low spots, there is moisture in the insulation or evidence of rodent pathways – you should consider having a knowledgeable professional provide you with a recommendation on how to address the issues. Depending on your location in BC and the level of efficiency you would like to see in your home, an attic can be called well-insulated if it has insulation levels of R40 to R60. If your home already has insulation levels above R30 and there are other under-insulated areas in your home, it may be more cost effective to start with insulating those other areas first. However, a new home built to code in BC’s climate zone 4 (Southern Vancouver Island and Lower Mainland) is required to have a minimum of R40 and a new home built to code in BC’s climate zone 5 (central BC) is required to have a minimum of R50. The EfficiencyBC Program encourages homeowners to bring all homes, regardless of age, to energy efficiency levels that meet or surpass the current building code where possible. Can I add new insulation on top of old insulation? In many cases you can add new insulation on top of old insulation, unless the old insulation is wet, mouldy, or vermiculite. If the old insulation is dry but appears to have previously been wet, you should look for the cause and repair the problem. Wet insulation should be removed or it can lead to mould, mildew or cause your ceiling or roof rafters to rot. In general, either batt or rolled insulation or blown loose-fill insulation (fiberglass or cellulose) can be installed on top of old insulation. Draftproofing should be completed prior to the addition of more insulation. Any new batt or roll insulation added on top of existing insulation in the attic needs to be without a vapor retarder (face). Most vapor retarders on fiberglass are made of kraft paper. The presence of this paper vapor retarder on top of between layers of insulation can trap moisture leading to mold or even rotting. Any existing batt or roll insulation in the attic should have the facing against the attic drywall floor or no facing at all. If your new insulation is rolled insulation, you should roll it out perpendicular to the joists. Be sure to use unfaced rolls. If you cannot find unfaced rolls, you can simply pull the kraft paper (vapor retarder) off without much loss of insulation. You should not tack down rolled insulation. Insulation need to be fluffy to block heat flow. You will reduce the R-value of the insulation by flattening it to tack it down. If you discover vermiculite insulation in your attic, be sure to have it tested for before doing work there. If the test reveals that asbestos is present, the vermiculite should be removed by a certified removal expert before disturbing it with the installation of more insulation. Consistent comfort: Maintains more even temperatures throughout your home. Quiet comfort: Reduces unwanted outdoor noise. Save money: Reduced energy consumption results in lower utility bills. Climate friendly: Reduced heat loss means less energy needed to heat your home resulting in a smaller carbon footprint. Reduced maintenance costs and improved durability: Your home lasts longer due to reduced condensation. This helps to prevent rot, mold, and mildew. What are the costs of insulation? Whether any remediation is required to address damaged insulation, mould removal, asbestos removal, etc. The quality of the insulation installation. A professional insulation contractor installing to a high level of quality will cost more. It is important to note that the costs associated with professional insulation installation may be offset by access to rebates and will be offset by reduced heating and cooling costs over the life of the home. What are the different insulation materials/types? These large sheets of insulation are easy to install in accessible spaces since they can be cut to fit and conform to slight surface irregularities. Most common batt or blanket insulation are made out of fibreglass and mineral fibre. They’re lightweight, easy to cut and handle, and generally have a high insulating value per unit thickness. Rigid and semi-rigid board insulation is made out of glass fibre or foam plastic materials such as expanded polystyrene, phenolic foam, polyurethane and polyisocyanurate. This liquid foam is mixed on-site and poured into enclosed cavities using a spray gun or sprayed directly on the surface of a building. The foam will expand once exposed to the air and sets in seconds. You can find closed cell polyurethane foam with refrigerant gases or a semi-flexible open-celled isocyanurate plastic foam. Reflective bubble foil and radiant barriers fall into the category of radiant foil insulation. This type of insulation is made with a reflective foil layer that’s said to reflect unwanted solar radiation in hot climates when applied properly. However, since Canada is considered a cold climate zone, radiant foils do not perform as well as they’re advertised. There are currently no specific standards for radiant insulation products. 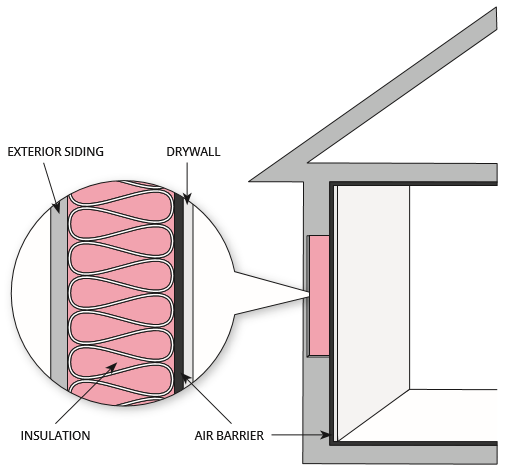 For more information about insulation types, visit Natural Resources Canada’s Keeping the Heat In. What is R (or RSI) value of insulation? The various types of insulation are rated based on their thermal resistance (i.e. how good they are at resisting heat flow). The two thermal resistance values you’ll encounter are the RSI and R-Value. The R-Value is an imperial system unit of measurement (ft2·°F·h/BTU) and the RSI Value is a metric system unit of measurement (m2·K/W). The higher the resistance value, the slower the rate of heat transfer through the insulating material. Spray foam, blown-in, and rigid-board type insulation are generally rated by their RSI Value per millimeter or R-Value per inch. Fiberglass and mineral-wool type insulation that is designed to fit into a framed cavity are generally rated by the size of the cavity that they are designed to fit into. To convert an RSI Value to an R-Value, multiply the RSI Value by 5.678. To convert an R-Value to an RSI Value, divide the R-Value by 5.678.
Who do I contact to safely remove vermiculite, and how does this effect my rebate eligibility? Vermiculite is a type of insulation that may contain asbestos fibres and is commonly found in older homes with insulation installed prior to 1990. If you suspect that there is vermiculite in your home, it is highly recommended that you take precautionary measures due to serious potential health risks. If exposed, asbestos fibres can become airborne in the home’s interior and cause serious harm if inhaled. For more information about the risks associated with asbestos exposure, please visit Health Canada. If you discover vermiculite in your home, do not disturb it. Contact a certified asbestos removal specialist that will follow BC hazardous waste regulations for options in relation to your renovations. For information about asbestos testing and having it removed professionally, please visit Work Safe BC. How should my crawlspace be insulated? A crawlspace can be insulated two ways. The walls of the crawlspace can be insulated on the inside or the outside of the home, creating a conditioned space; or the floor above the crawlspace can be insulated, creating an unconditioned space. Heating ducts and water pipes in the crawlspace will not have to be insulated and will not freeze. Any heat loss from the ducts will not be wasted. It is usually easier to do a thorough insulating job on the walls. Especially when the crawlspace is shallow or the joist spaces are uneven or oddly shaped, it can be challenging to get into the space to insulate the floor above the crawlspace. A crawlspace with insulated walls needs to be closed (i.e. any vents opened to outside need to be closed and insulated) since it would be treated as a conditioned space. Add a moisture barrier to the crawlspace floor if there is not already one present. This is to prevent moisture from entering the crawlspace from the ground and moving through your home. Before starting any work in the crawlspace, ensure that any damage and issues (e.g. cracks in the foundation wall, water leaks from pipes or infiltration from outside, etc.) are addressed first. Talk to your contractor or Energy Advisor for the best option for your home. If you discover rats or mice (rodents) in your insulation it is important to eliminate the problem before adding more insulation. Rodents can be identified visually (evidence of tunneling in insulation or rodent droppings) or by hearing rodents moving around within walls or attics. Rodent tunneling creates holes in your insulation, impacting the effectiveness of the insulation. Rats and mice have babies often, so it is important to find and get rid of them quickly and efficiently to reduce the potential for damage to your home or creating a health issue. Take preventative measures: eliminate food and water sources, eliminate hiding and living places, seal all possible entry points and repair any cracks or gaps in doors, roofing, or foundation. Repair any damage caused to the existing insulation. Once you have followed these steps you can insulate your home.